Tomorrow, if the snow gods allow, I will be winging my way toward my fourth Global Volunteers experience, in Queretaro, Mexico. Although I’ll be sticking to North America, and will have no jet lag to contend with, I’m still giving myself a couple of days to acclimate to my new surroundings. And what wonderful surroundings they will be! I will freely admit to having extremely limited knowledge of our southern neighbor’s geography. I signed on without having any idea where Queretaro is, or anything else about the area, for that matter. But that is all changing. In the past two days, I’ve been cruising the internet, like a college student at exam time, trying to learn everything I can about the place I’ll call home for the next 17 days. And I’m more than happy to share this new-found knowledge with you–oh, my loved ones. In the past, my experiences with Mexico were confined to the coasts: Cabo San Lucas and Playa del Carmen. This time, I’ll be in the interior of the country, so no need for bathing suit or flip-flops. Here’s a visual, for those of you, like me, who need to see where you are going, with Texas providing a point of reference. 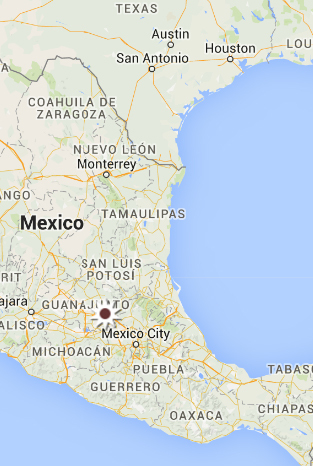 Queretaro is right smack dab under that red dot. The city and the state share the same name–although the city is officially called Santiago de Queretaro. I didn’t even know that Mexico was broken into states–I just thought of that land mass as “Mexico”. But there are 31 of them, and Queretaro is one of the smallest, as you have probably figured out by its obliteration under the dot. It’s about two and a half hours from Mexico City, to give you an idea of distances and scale. As with other things in life, don’t be fooled by size. Queretaro may be small in territory, but it has a lot going for it. It is chock full of beautiful 17th and 18th century buildings, enough to be named a World Heritage Site by UNESCO in 1996. Many were former churches, convents and missions, (not surprising given the Franciscans founded the city in 1531, looonnnng before those Pilgrims and Puritans set foot up north). There’s scads of history in them thar hills, but I’m saving all that for future posts and possibly a quiz or two. Here’s a sneak peek at my new world. I’ll be staying at the Hotel Hidalgo, which unlike the Casa de la Marquesa, probably didn’t give Google any advertising dollars. Still, what did we do before Google maps?! The green patch in the bottom right corner is the street market, which I will undoubtedly visit. I also checked out Jardin Zenea, and that looks to be quite lovely. I’m thinking I’ll have plenty of photo ops on my days off. This will be quite a change of pace for me. For my other three projects, I worked with either preschool or elementary school children. This time, I’ll working with adolescents and will be following a varied schedule. To accommodate early and late classes, some days we’ll go from 7AM to 2 PM and others from 3 PM to 9 PM. Because the volunteers are in such demand, and the need is so great, we will not see the same class twice, something else that will be quite different for me. I’m lucky enough to have an Ecuadorian sister-in-law, who humors me by letting me practice my Spanish on her. Any time yo hablo espanol, it is guaranteed to get a laugh out of mi hermana preferida. I’m sure it is because of her amazement and admiration of my fluency. We’ll see how it goes with the students. I’m betting I’ll be able to pick up a phrase or two from them to completely dazzle and amaze the folks back home. I’m not sure about the internet capabilities in the hotel, or MY capabilities given the work schedule, but I plan on posting whenever I am able. DEEP in the heart of Texas… I mean Mexico …as the song goes. Those teens have no idea how much FUN they are about to have!! thanks Jean, I grabbed a couple of my mother’s People magazines. I figure there should be plenty to talk about with THOSE articles. Shelley, what a wonderful gift you are giving (and I don’t mean the People magazines). Often we focus on the task at hand, not realizing there might be an interaction or glimmer of an idea for one of the participants that significantly impacts his/her future. I’m delighted we’ll be reading not just a travelogue/history lesson of beautiful architecture and culture, but a (sometimes humorous) peek into the adolescent minds and their translation meanderings. My favorite GV project was in Dolores Hidalgo. Try to go over there if you can – it’s the cradle of Mexican independence — and Guanajuato as well. I’ll be interested to hear about the actual work — how it’s organized. I can’t imagine you won’t love it. Have fun! How great to hear from another GV volunteer. Thanks for the tips. I have all day Friday and Saturday to explore. Pam is my group leader, and she has been immensely helpful already. I have never been to Mexico so I am really looking forward to getting there vicariously through your blog. What an adventure it will be! wow–I can’t believe I’m going someplace that YOU haven’t visited, Marilyn. Looking forward to seeing you, Sally and Victoria in March. I’ve never been to the interior of Mexico and look forward to tales of your adventure! And, of course, pictures. GV sounds like a great way to travel. Good to hear from you Janis. I’m looking forward to reading about YOUR adventure too. Like you, I might encounter internet problems, so I may be posting about the adventure when I get back. I am wondering…is Mexico ready for you?? have fun! much love. Janet, thanks so much for your words of encouragement.